Putting these together we can say that Maharishi considered the enquiry into the source of ‘I’ notion resulting in destruction of Ahamkara as the greatest tapas. One usually refers to one’s body, mind or intellect by the first person pronoun “I”. When one says ‘I am not well’, ‘I’ refers to the body. When one says ‘I am happy or sad’, ‘I’ stands for the mind. When one says ‘I find the problem tricky’, ‘I’ refers to intellect. But one also says, my body, my mind, my intellect implying that they are one’s possessions and not the real Self which is beyond all the three. By enquiring "Who am I", one is enquiring into the notion of ‘I’. This is enquiry about the nature of one’s real Self and is called Self-enquiry. Maharishi’s prescription for this exercise is to turn one’s attention inward and enquire wherefrom the ‘I’ thought arises. By asking continuously in a focused way “Who am I” the mind can be made to look inward, towards the source of ‘I’ thought, the Self, which is pure Consciousness. This pure Consciousness is none other than Supreme universal power, which is one without a second, eternal, infinite, and indivisible and which is also called Brahman at cosmic level and Athma at the level of individual. It pervades all beings living and non-living in the universe and is the same in all; only the upadhi in each case is different. Kena Upanishad in Mantra 2 calls it “The Eye of the eye, the Ear of the ear, the Prana of prana, the Mind of mind, Tongue of the tongue”. It also further states in this mantra that the wise man knows the Source, the Athma, separate from these faculties. The process of separation and transcending the identification with senses, prana, mind and intellect is achieved through Self-enquiry and leads to Self-Realization i.e. realizing Athma only is one’s Real Self. This knowledge that only Athma, which is same as Brahman is one’s Real Self is Athma Jnanam. Maharishi calls this Athma, which is the source of ‘I’ thought, also as the heart, not the physical heart which is a muscular organ on the left side pumping blood all through the body but the spiritual heart on the right side, two digits to the right from the median, which is the core of one’s being. It is the place where one, young or old, involuntarily points his finger when he says ‘I did this or I did that” or makes some such similar statement. 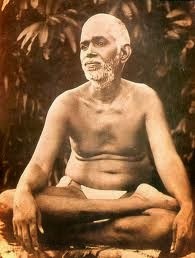 Maharshi said “Call it by any name, God, Self, the heart or seat of Consciousness it is all the same…. It is by coming down to the level of ordinary understanding that a place is assigned to the heart in the physical body". All our thoughts arise and resolve in the mind and if we analyze the mind, we find it is nothing but the flow of thoughts. When the thoughts are arrested as in Nirvikalpa Samadhi there is a stillness of mind and direct communion with one’s real Self is achieved. This state of stillness of mind is called the state of Manonasa. The philosophical meaning of Manonasa is the vision that everything other than Athma, including the mind and the perceived universe, is all mithya. Anathma can be experienced and anathma has utility; but it is only apparently real and not absolutely Real. Further all our thoughts revolve around the ego ‘I’ thought. So when one enquires into the source of this ego ‘I’ thought under the guidance of a competent Guru, one realizes the Athma as one’s true Self. On this realization, deahabhimana drops off, Manonasa occurs and one feels totally fulfilled, enjoying the pure bliss of one’s divine Self. For this internal enquiry, he did not prescribe any path. As he once told a questioner, “Guru, who is God or Self incarnate, works from within and helps the man to see the error of his ways, and guides him in the right path until he realizes the Self within …….. The Master is both ‘within’ and ‘without’, so He creates conditions to drive you inward and at the same time prepares the ‘interior’ to drag you to the Centre”. So the external Guru turns your attention inward and the internal Guru draws you to Himself and makes you realize that as Athma, you were never bound nor were you ever in samsara. So in this tapas of Self-enquiry that is started seeking something that one considers as outside oneself, he ends up with the discovery that what he sought externally was all along with him only, with its mind-boggling corollaries, waiting to be discovered. So this indeed is the greatest tapas that one can undertake.